Konark, also known as ‘Arka-Tirtha’, is famous for the 13th century Konark Sun Temple, dedicated to Lord Surya. Konark is a place with great religious as well as historical importance. There are numerous sight seeing opportunities for both national as well as international tourists. Here are some of the important tourist places to visit in and around Konark. Konark Sea Beach is situated just 2 miles from the Sun Temple at Konark, Orissa. The Sea Beach at Konark is one of the finest beaches in the world. The Sea Beach at Konark is calm and quieter than Puri beach. Konark Museum is maintained by the Archaeological Survey of India and is located outside the temple compound. The Archaeological Museum houses numerous sculpture, images of Hindu gods and goddesses, and several other antiquities. Kuruma is a small village situated around 8 km from Konark Sun Temple in Orissa. Kuruma village is of great archeological significance and several excavations done here had unearthed some ancient Buddhist antiquities. Some of the images unearthed from Kuruma village include an image of Buddha seated in Bhumisparsa Mudra, an image of Heruka (the name of a category of wrathful deities in Vajrayana Buddhism), and a 17 m long brick wall. Kuruma is regarded as one of the sites featuring Buddhist stupas, as mentioned by Hiuen T'sang. The place can be reached by jeep from Konark. Balighai Beach is situated around 8 km from Puri and is the place where the Naunai River meets the sea at Balighai. Balighai is a famous picnic spot noted for the spectacular sight of the Bay of Bengal coast and a gentle casuarina-lined river lying juxtaposed to one another. Tourists can sometimes catch a glimpse of the Baliharina deer which inhabits in the region. The Sea Turtle Research Center is also located at the Balighai Beach. Astaranga is a coastal village situated 91 km from Puri and 10 km from Kakatapur. Astaranga offers a beautiful view especially during sunset. The place is also a center of fishing and salt production. About 14 km from Kakatapur, on the way to Konarak is a place called Chaurasi where tourists can visit the temples of Amareswara Temple, Laximinarayana Temple (Lakshmi Narayan) and Barahi Temple (Varahi Temple). Barahi Devi is regarded as the Mother of Goddess and is said to have worshipped according to tantric practices. Chaurasi village is around 35 km from Konark. Kakatpur (also spelled Kakatapur) is a small village situated near the Prachi River in Puri district of Orissa. The village is famous for Maa Mangala Temple dedicated to Goddess Mangala. 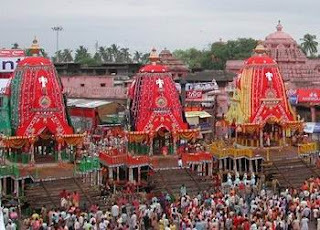 The annual Jhamu Yatra Festival (Jhamu Jatra) celebrated here in the month of Chaitra attracts thousands of pilgrims from Orissa and nearby states. Kakatpur is 45 km from Konark and about 60 km from Bhubaneswar. Pipli is a small town situated on the highway between Bhubaneswar and Puri in Orissa. The town is renowned for its exquisite applique work. There are numerous shops in the road from which tourist can purchase beautiful appliqued handbags, wall hangings, pillow covers, huge garden umbrellas, appliqued bed sheets, cushion covers, letter cases, and canopies. Tourists visiting Pipli can also visit the Dhauli Shanti Stupa built by the Japanese, which is situated nearby. Puri is a major pilgrim center in India located in Orissa on the coast of Bay of Bengal. Puri is famous for the Jagannath Temple, one of the most famous Temples in Orissa. Saint Adi Sankaracharya founded one of the Peethas here. The annual Puri Beach Festival held in November and the Puri Rath Yatra (Puri Car Festival) celebrated during June/July attracts thousands of Hindu pilgrims. Puri is 35 km from Konark and 60 km south of Bhubaneswar.